Introduction. System Engineering & Management, Inc. , (“SysMgt.com”) strives to offer you (“Customer”) unparalleled service, including the availability of its Hosted Microsoft Exchange, BlackBerry Enterprise Server, ActiveSync, Advanced Anti-Spam & Virus Protection, Shared Web Hosting, Dedicated Web Hosting, DataLock Online Backup services (the “Hosted Services”). By this Service Level Agreement (“SLA”), SysMgt.com guarantees to Customer that its Hosted Services will be available 99.9% of the time during any calendar month, subject to the terms and as set forth in this SLA (the “Uptime Guarantee”). Covered Services. SysMgt.com provides the Uptime Guarantee in this SLA for its Hosted Services, calculated on a monthly basis, provided Customer (i) is in good standing with SysMgt.com (i.e., is not delinquent in payments, and has not otherwise breached any of its obligations to SysMgt.com), and (ii) requests the Hosted Service Credit (as defined below) from SysMgt.com for its noncompliance with the Uptime Guarantee in writing within 30 days of the end of the month in which such noncompliance occurred. (vi) scheduled maintenance of the Hosted Services, conducted on a regular basis, of which SysMgt.com will give Customer a minimum of 24hrs advanced notice by email or notification posted to the SysMgt.com website. (vii) emergency maintenance of the Hosted Services, not to exceed 8 hours in any month, for which Customer may not receive advanced notice. Non Compliance. In the event SysMgt.com fails to meet the Uptime Guarantee regarding one or more of its Hosted Services (the “Affected Service(s)”), as verified by SysMgt.com based on its monitoring logs (a “Service Outage”), Customer will be entitled to a credit for future Hosted Services of the same type as the Affected Services ( “Hosted Service Credits”). Hosted Service Credit Calculation. For each full 1% of downtime, of verified Service Outage in any calendar month (based on a 30-day month calculation), excluding downtime caused by an Excused Outage (an “Outage Unit”), Customer will receive a Hosted Service Credit equal to 5% of the monthly subscription fees paid by the Customer for the users impacted by the Affected Service. Should a Service Outage span more than one month, the calculation of Hosted Service Credits starts over at the beginning of each month. Hosted Service Credits Payment. Hosted Service Credits will be issued in the form of a credit towards Customer's next invoice, unless the affected month is Customer's last month of subscription to the Affected Services, in which case the dollar value of the Hosted Service Credits, as calculated herein, will be issued to Customer by SysMgt.com within 60 calendar days from the end of the Customer’s last month of subscription to the Hosted Services. Total Credit Limits. Hosted Service Credits will apply only to a Customer’s users directly affected by a Service Outage, and Hosted Service Credits may not exceed 50% of the total subscription fees of the Affected Services, excluding applicable taxes. Hosted Service Credits will not be issued for any fraction of an Outage Unit and will not accrue or carry over from month to month. Notwithstanding anything set forth in this SLA, the Hosting Service Credit described herein shall be the sole and exclusive remedy of the Customer in connection with any outages, unavailability or breach by SysMgt.com of this SLA. This agreement is between you, the subscriber to the System Engineering & Management, Inc. (SysMgt.com) Email service. SysMgt.com defines “Spam/Junk emailing” as “the sending of e-mail(s) to users that have not explicitly asked to receive the sender's message". SysMgt.com defines “Bulk emailing” as “the sending of e-mail(s) in a bulk fashion regardless of whether or not the recipient of such email(s) have requested the correspondence”. Sending either spam or bulk email through the SysMgt.com system is not permitted and will not be tolerated. SysMgt.com reserves the right to refuse, suspend, or even terminate service at any time, and without preceding warnings, to anyone who violates or intends to violate this policy. SysMgt.com will not be held responsible if your domain name is blocked by internet service providers (ISPs) for sending spam/bulk e-mails. SysMgt.com also reserves the right to limit the number of outgoing recipients of an individual email message to one hundred (100). * Automatic System Updates – SysMgt.com’s servers regularly update themselves with patches and bug fixes. Occasionally, these patches/fixes can affect our servers in an unexpected, detrimental way. Many of these patches/fixes are installed automatically and cannot always be tested prior to their implementation. You specifically agree that SysMgt.com cannot be held liable for any missing data, corrupted data, incorrect transmission of data, failure to provide service, delay of service provision or anything in any way connected to the SysMgt.com Hosted Email Service in excess of the cost of service provided. 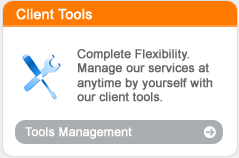 Cumulative liability of SysMgt.com to a customer shall not exceed the total monthly service fee of the immediate prior one month of service. You agree that SysMgt.com is not responsible for any unauthorized access or modification of your data stored by or transmitted via the SysMgt.com service. You also agree that SysMgt.com is not responsible or liable for any content sent using, or received from, the SysMgt.com service including that which may be illegal, obscene, defamatory, threatening or that may violate any trademark or copyright. SysMgt.com Hosted Email Service includes SPAM filtering to help prevent incoming spam. SysMgt.com cannot be responsible for filtering out unwanted/offensive content sent to your SysMgt.com hosted email account or that may exceed the capacity of your SysMgt.com email account. Email determined as SPAM is deleted prior to delivery to the server and is not retrievable. SysMgt.com works hard to ensure low false positive rates but should they occur SysMgt.com is not liable for lost, delayed or undelivered email. The SysMgt.com Hosted Email Service provides virus protection against incoming email viruses sent to your SysMgt.com Hosted Email Service addresses. All incoming messages to your SysMgt.com Hosted Email Service domain are scanned. It is our policy to delete affected attachments prior to delivery to your SysMgt.com Hosted Email Service mailbox. SysMgt.com virus protection uses the latest technologies to help ensure your protection. Our server software (virus patterns) is updated nightly. Virus protection is an ongoing process and it’s impossible to protect against 100% of the virus threats and unfortunately we cannot be held responsible for new viruses that are not detected by our scanning software. End-users are responsible for protecting their computers and ensuring they are virus-free. We recommend that each end-user run a local anti-virus software package on their PC for additional protection. SysMgt.com will not be held responsible if your domain name is blocked by internet service providers (ISPs) for sending virus-infected emails. Most viruses are transmitted by email, but not all. If your email software is connected to another email service other than SysMgt.com, it is possible that virus-infected email could be pulled into your SysMgt.com Hosted Email Service account from another service. SysMgt.com cannot be held responsible for virus-infected email originally sent to email services outside of SysMgt.com. SysMgt.com Hosted Email Service includes the licensing for Microsoft Outlook® Software. The license fee is included with the monthly SysMgt.com Hosted Email Service fee; however we may charge a nominal fee to ship the media to you. End-users are allowed to install the software one time and only on one PC for each SysMgt.com Hosted Email Service mailbox. Each end-user/individual using the SysMgt.com Hosted Email Service must purchase an individual Subscriber Access License (SAL) – otherwise know as a “mailbox” for this service. Unfortunately, sharing of a single mailbox is not allowed unless additional licenses are purchased on a monthly basis for each user. If you cancel your SysMgt.com Hosted Email Service account you acknowledge that you are responsible for uninstalling any Microsoft Outlook® client software that is licensed as part of the SysMgt.com Hosted Email Service. It is the end-user’s responsibility to keep his/her password confidential, and to change the password on a regular basis. SysMgt.com is not responsible for any data losses or security issues due to stolen passwords. SysMgt.com recommends that you use passwords that contain numbers and symbols in order to prevent unauthorized users from guessing commonly-used choices (i.e. “12345”, “password”, etc.). SysMgt.com support does not have access to viewing existing passwords. For security reasons, SysMgt.com support can only reset passwords. Upon cancellation, your SysMgt.com email and contact data located on SysMgt.com’s servers may no longer be available. It is the end-user’s responsibility to retrieve this data prior to the request for cancellation of the service. SysMgt.com cannot guarantee retrieval of data once an account is cancelled. The base SysMgt.com Hosted Email Service does not include nightly "Brick Level" backups. We apologize but SysMgt.com does not offer Brick Level backups. 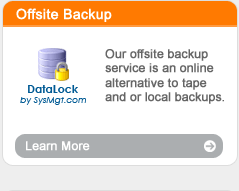 SysMgt.com utilizes industry standard practices in backups and restoration of Hosted Exchange data. SysMgt.com's servers are configured to keep a cache or live backup for a period of 7 days containing deleted items and 30 days for deleted mailboxes. If a user deletes an item from their mailbox the system will let them restore it via Microsoft Outlook®. To recover the deleted item, the item has to actually have been deleted – i.e. if a user "drags" the data or otherwise exports the data off the server, the system does not treat this as a delete. In that situation the data may not be recoverable. Additionally if a customer deletes an entire mailbox we can attempt to restore the mailbox by recovering via the deleted items folder. Deleted Item/Mailbox retention protects the customer in the event they execute a delete command against an individual mailbox or individual mailbox data.